Hotel PLR Grand is a three star hotel in the temple city of Tirupati offering comfortable accommodation with state of the art facilities to its guests. 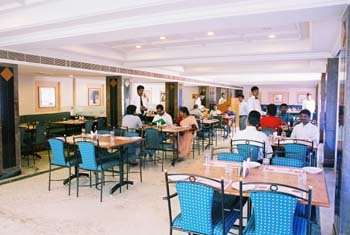 Hotel PLR Grand is located next to APSRTC Central Bus Station in Tirupati. The hotel is at a distance of 0 - 2 kms from Tirupati railway station and about 11 - 15 kms from Tirupati airport. The distance to the base of Tirumala Hill is 3 kms from where the distance to the main temple is 22 kms. The journey should take you an hour. Banquet Facilities, Travel Counter, Breakfast Services, Laundry Facilities, Complimentary Newspapers in Lobby, Coffee Shop/Cafe, Airport Transportation, Conference Hall, Room Service, Backup Generator. Iron/Ironing Board, House Keeping, H/C Water, Toothbrush/Razor on Request, DVD Player, Wakeup Calls, Attached Bathroom, Cable/Satellite TV, Air Conditioning Room, Complimentary Newspaper. Banquet Facilities, Breakfast Services, Business Facilities, Coffee Shop/Cafe, Conference Hall, Doctor on Call, Laundry Facilities, Parking, Restaurant, Room Service. User reviews for "PLR Grand Tirupati"